Your Sunday roast has never looked this good! For the aubergines, preheat the oven to 180°C. Place the scored aubergines in a baking tray. Drizzle with the 30ml (2 tbsp) olive oil. Season to taste. Roast in the preheated oven, about 45 minutes. Remove from oven and set aside. Do not switch off the oven. For the leg of lamb, place the meat in a roasting dish. Drizzle with the 50ml olive oil. Top with the peeled garlic cloves, fresh rosemary sprigs and chopped mint. Season to taste. Roast in the preheated oven, about 30 minutes. Remove from oven and set aside to rest, about 5 – 10 minutes. 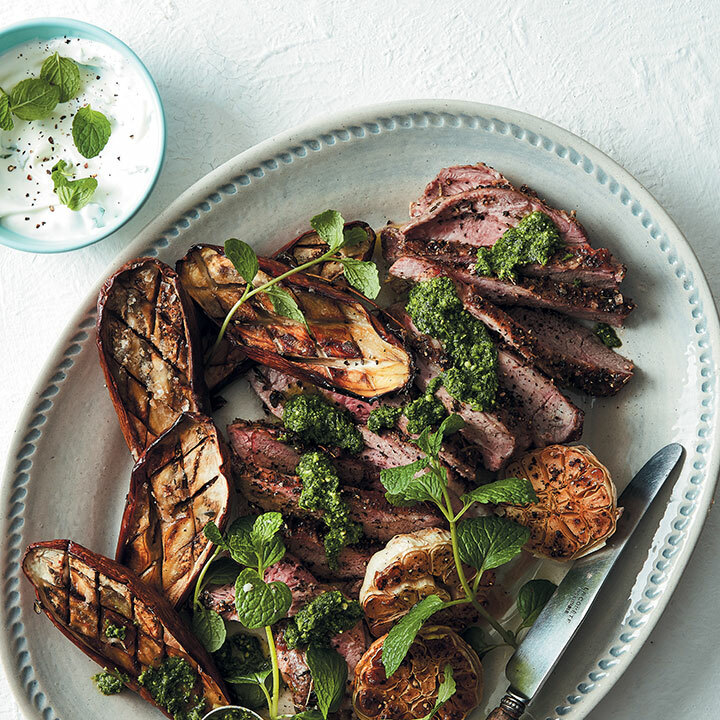 While the leg of lamb is roasting, make the mint pesto. Place the 200ml olive oil and 200g fresh mint, along with the remaining pesto ingredients, in a food processor. Blitz until combined and smooth. Thinly slice the roasted leg of lamb and arrange the slices in a large serving platter. Top with dollops of the mint pesto. Garnish with the mint sprigs and roasted garlic halves, if desired. Serve with the roasted aubergine halves. Enjoy with the double-cream Greek yoghurt.